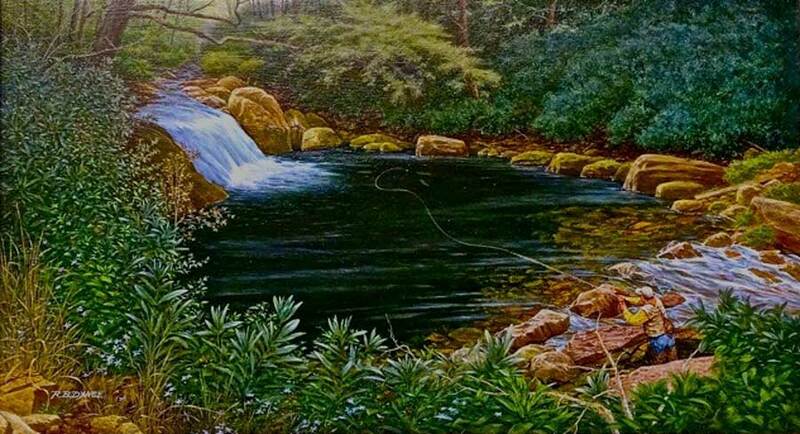 Robert Dance is a nationally known nautical artist who also fly-fishes and paints fly-fishing subjects. His work has been shown in the Smithsonian, was on the first National Park Stamp, and was presented in the White House. He lives with his artist wife, Coleman, in Kinston, North Carolina, where his studio is also located. 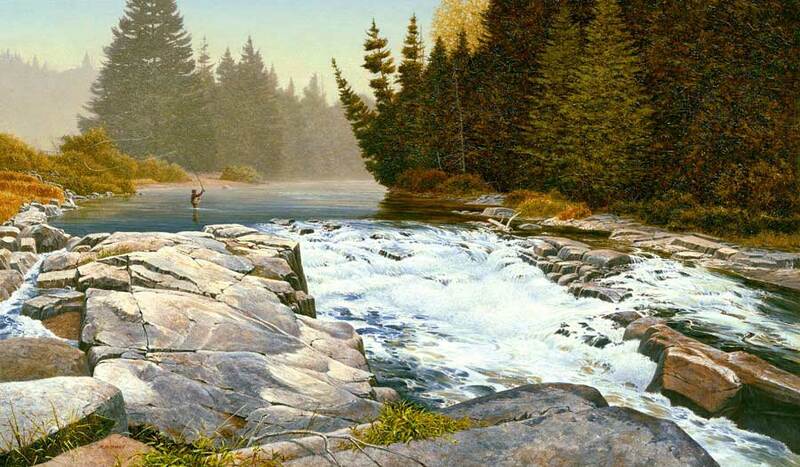 “Fishing the Ausable,” Alkyd on canvas. At 84 years of age, I’m sure I’m the oldest artist to appear on this blog, and I came to fly fishing rather late compared to many others. However, I have been painting since the age of six, after being born in Tokyo, Japan in 1934. Unlike my friends, I did not put away my box of crayons upon maturity and still enjoy scribbling the sights of nature in childlike fascination. I have found that nature is the greatest teacher and an endless source of wonder. “Rainbow’s End?” Alkyd on canvas. 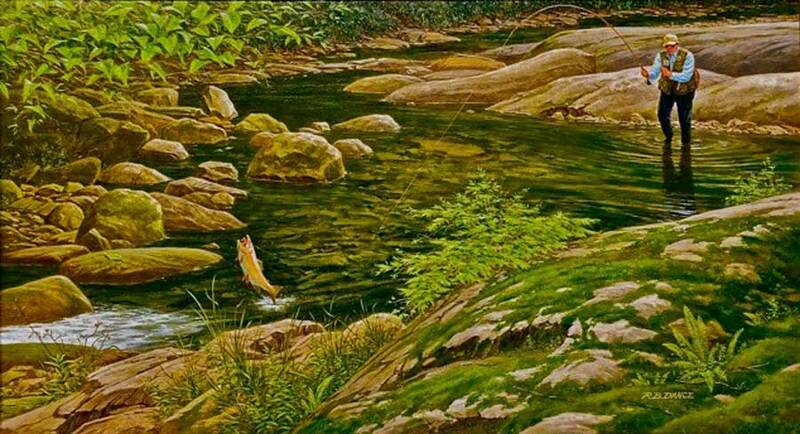 When I was in my late thirties, Frank Willingham, the man in my painting above, invited me to try fly-fishing on the rivers and streams near Mount Mitchell, North Carolina (the highest mountain East of the Mississippi River). Frank was a master fly fisherman and decided to teach me fly casting in his backyard before we headed for the mountains. Watching Frank, I was immediately stuck by the beauty of watching a master control all that line in such an artful manner; it was a subject made for painting. He worked with me for several days, and though I had no equipment, he lent me his to practice on in my spare time. “Casting for Lunkers,” Alkyd on canvas. Finally, up on the mountain, Frank handed me his bamboo rod–had I known the value of such a rod, I would have been too intimidated to even try it–and told me not to worry because he had two tips for the rod should I break one. Luckily I did not break the rod, and with Frank’s instructions on the stream, I even caught a few small trout. Over the years, I never became the master that Frank was and would describe myself as a “sneaky” fly fisherman, quietly crawling on my knees, using dark-and-silent non-chrome reels and rod guides, and wearing clothes that blended with nature. Eventually I caught many brook trout, large rainbow trout, and a 27-inch brown trout. Thank you, Frank! “Prelude to a Memory,” Alkyd on canvas. As he became older (as he is in the painting) Frank would only fish the larger pools (as I do now), rather than climb the steep, rocky stream. Frank has since passed away after a wonderful life, and I often think of him in gratitude for introducing me to this beautiful sport. Check out more Robert Dance paintings on his Facebook page.